Federal employees remain overwhelmingly opposed to the partial government shutdown, according to a new poll by Government Business Council and GovExec.com, with 72 percent against it and just 21 percent supporting it. 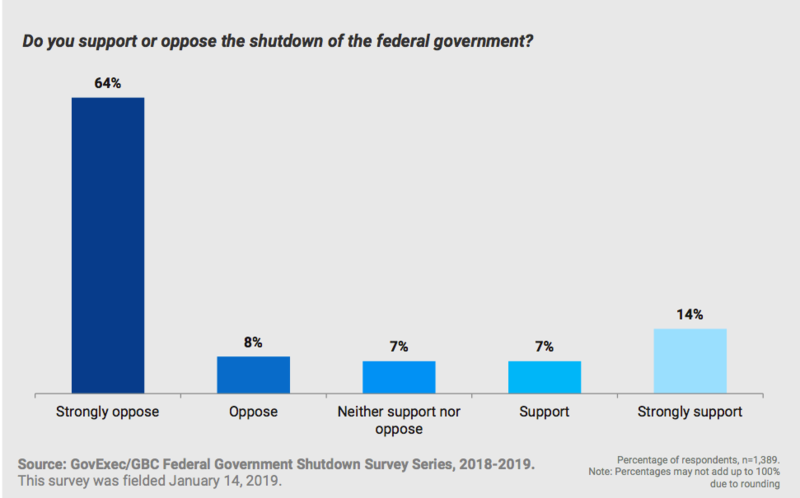 The results vary little from the last GBC/GovExec survey, conducted during the first week of agencies closing their doors, when 71 percent of federal workers said they opposed the shutdown. Now in its 25th day, federal employees appear cemented in their shutdown views. Just 34 percent of federal employees support President Trump’s request for funding a wall along the U.S.-Mexico border, while 56 percent oppose it. Of those against the wall, more than four out of five are strongly opposed to it. One in 10 respondents said they were neither for nor against Trump’s push for the wall. Those working at shuttered agencies, which includes more than 800,000 employees who are not currently receiving pay, generally reflect the opinions of the federal workforce at large. Employees at closed agencies were only more opposed to the shutdown than their colleagues at fully funded agencies by 3 percentage points. Employees who are currently working—either at shuttered agencies without pay or at funded agencies—were slightly more opposed to the shutdown than their furloughed colleagues. Democratic federal employees are nearly united in their opposition to the shutdown: 97 percent said they oppose it, while just 2 percent support it. A slight plurality of Republicans, 47 percent, support the shutdown, marking a reversal from that last poll. Seven in 10 independents oppose it. Three-quarters of Republican feds support the wall, meaning many support Trump’s push for a barrier along the U.S.-Mexico border but not a shutdown as a means for securing the necessary funding. Federal workers are not confident the shutdown is nearing its end, but also do not think it will drag on for months or years, as Trump has threatened. Just 12 percent said it would end in the next week, but 65 percent think agencies will reopen within the next four weeks. 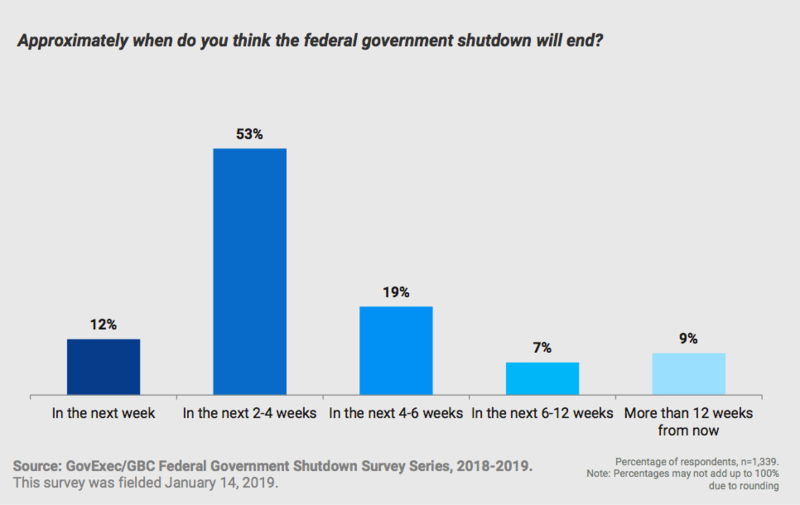 About one-in-four feds believe the shutdown will last four-to-12 weeks, while 9 percent guessed it will extend beyond three more months. Lower-ranked employees are slightly more supportive of the shutdown. About 26 percent of employees in General Schedule-12 positions or below support it, while 20 percent of senior leaders in grades of GS-13 or above said the same. Just 31 percent of senior leaders support Trump’s push for the wall, compared to 40 percent of the lower-ranked employees. Many feds are still worried about their current status. One-quarter of those who are not currently furloughed said they may be sent home in the near future. About 350,000 feds are on furlough status now, while an additional 500,000 continue to work as excepted or exempted employees. 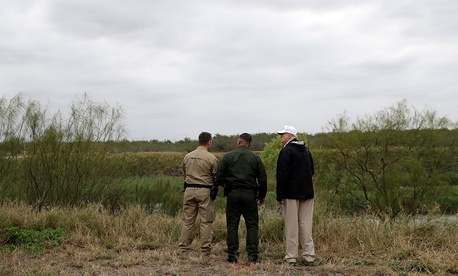 The findings undermine Trump’s repeated claim that federal employees largely support the shutdown because they want a wall. He has also sought to minimize the appropriations lapse's impact on the federal workforce, saying the affected employees can make “adjustments” and negotiate deals with their landlords. Trump reiterated that statement, in contrast to all evidence, on Monday. Government Business Council and GovExec released the survey on Jan. 14, 2018, to a random sample of Government Executive, Nextgov and Defense One subscribers. The survey includes 1,228 federal employees and has a margin of error of plus or minus 2.8 percent. For full topline results, click here.